RC Radio: The Tomb and Letting go, additional comments. You are a creator in training. As such, you have to learn how to create your world in harmony and without conflict. You also have to make sure your creations do not cause others harm or block their own spiritual path. Let’s face it, these creations do not often go as planned and can often be born of the elements that create disharmony. When problems happen with your reality creating, they need to be resolved, understanding has to set in, and, perhaps, some repayment is needed as well. 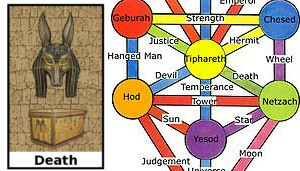 The Tomb is located between Tiphareth and Netzach on the Tree of Life. The Tomb is the last of the three cleansing places, as I call them, that can help bring a conclusion to a bad reality creating project. Resolution Point (Tower card) is the first part of the process. You go there to examine why something in your life failed. This helps you realize how conflict and fear have created it. The Plantation (Devil card) is the second part of the process. Here in phase two you use this place to learn what you need to let go of to move forward, so another great fall does not occur. 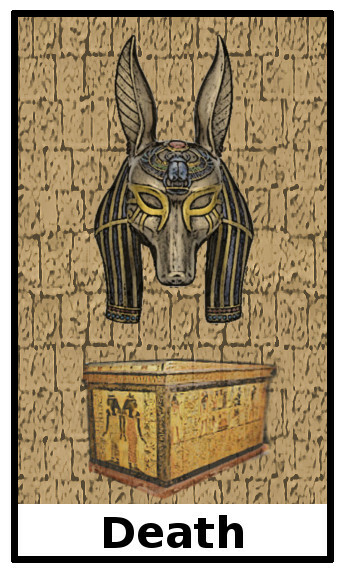 Lastly is the Tomb (Death card). Now you know what has to go and change, and now you have to let it go so you can be reborn. How long that takes depends on your level of sorrow, understanding, repayment, and fear of an unknown future. The Tomb is where you go to wait for rebirth. It is a place of reflection and solitude. You must examine the past and what happened, what caused it, and what has to change so you can move forward and start anew. Your experiences here will help you to do that. You may meet with various aspects of yourself, the people involved in it, those that were hurt by it. You may revisit the past and what you hoped to gain from it. You will often find that multiple areas of your life seem to come together here in a strange mix, but it is that mix of things that need to be shed or examined so you can move forward. Once you have come to an understanding of it, released your grief or sorrow, then you can move toward the re-birthing chamber to be washed of the residual energies you carry from it and then be reborn. 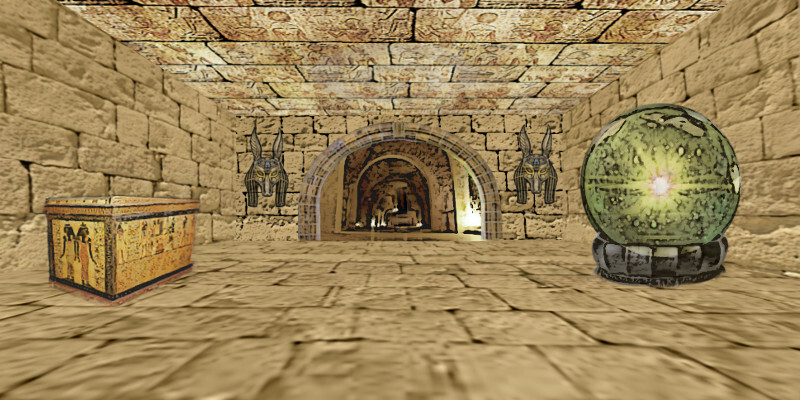 When you enter the Tomb, if your situation warrants it, you may be greeted by Nefertiti. She will give you the “mask of sorrow,” which you can wear and will help you to shed some of the grief left within you. All your grief must be left behind if you are going to be reborn. You can also visit the “Oracle of the Future.” The Oracle is a crystal ball you can look into to get a glimpse of the future, your future, after your rebirth. Finally if you wronged anyone along the way, Anibus may ask you to give up something as a toll to allow you to pass into the “Rebirth Chamber.” Once your toll is paid, your grief released, and understand what went wrong, you can pass into the chamber. However if something unresolved still remains, you will be blocked from entering the chamber. You may be asked to revisit one of the other places (Plantation or Resolution Point) to re-examine that phase of the process. Then once that is done, come back here to the Tomb and try again. Upon successful use of the “Rebirth Chamber” you will receive the energy of “renewal.” This energy allows you to tap into your hidden inner strength to move forward when things have not gone so well lately. It is like getting a second wind when none was there before. This renewal energy will help you to move forward again in your new reality. It makes you feel young and often gives you a positive outlook on the future. The one time gift here is a permanent spiritual energy upgrade to a higher level. Because you now know how to resolve reality problems quickly, your energy can be safely raised to a new level. But keep in mind that as your spiritual energy level goes up, so does the decrease in time from thought to manifestation. Which is a good thing if what you want to create is just and good. If not, well, that means the collapse of what you are creating will happen just as quickly. Mask of Sorrow: helps you to understand your grief. Book of Light: Open the book to bring illumination to yourself or others. Energy of Renewal allows you to move forward and be reborn.